The June WER report describes changes in the development plan and contracting strategy in several near term floater projects, reviews the contractual implications of a premature arrival of an FSRU in Ghana where offtake infrastructure has not yet been built and provides background for Petrobras’ request for revised bids on the Libra Pilot and Sepia FPSOs and questions whether one or both tenders will be cancelled. We also update the underlying market fundamentals, which continue to strengthen. 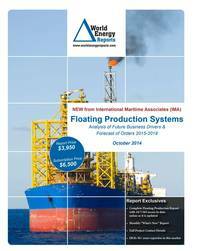 In the data section of the report are details for 246 floater projects in the planning stage, 55 production or storage floaters now on order, 281 floating production units currently in service and 36 production floaters available for redeployment contracts. Charts in the report update the location where floating production and storage systems are being planned, operating, being built and to be installed. Accompanying excel spreadsheets provide the report data in sortable format. Information is current as of 19 June.